I began this post almost 5 months ago now. Sometimes it just takes that long for a house project to be complete. Or maybe it was the looming party at our house that motivated me to get it in gear. Whatever the case - it's FINALLY DONE! 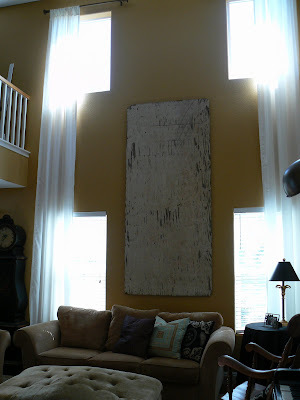 We repainted the front living room during Spring Break, hung new curtains, rearranged the large furniture and then needed some new artwork to fill those 17 foot walls. Here's the room AFTER it's been painted - dark walls, light curtains, no artwork yet. (Of course I wait until I'm in the middle of the project to take a picture - sheesh!) 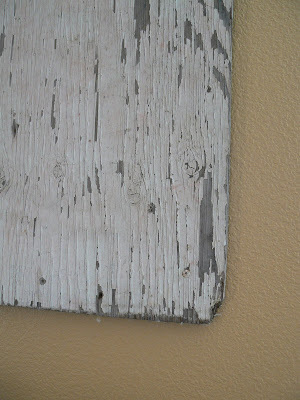 Note the 2x4 brace that has been screwed into the studs to hold up this heavy "art piece". I discovered this lovely piece of wood on the side of our house. And by lovely I mean perfectly aged, distressed and with the perfect patina for our rough and tumble crowd (all of those adjectives translate to Jeremy's eyebrows raising to say, "you want me to put that up in our house?!"). It came in straight from the backyard. No touch ups, washing down, or sanding needed. Hold on to your hats and glasses people - we're not done yet! The board stayed up like that for about 4 months. So many people have come through the house with all their different opinions of my "art". They've either loved it or disliked it, but everyone had a comment. And if you didn't like it, no worries, I still love it and that's all that matters! 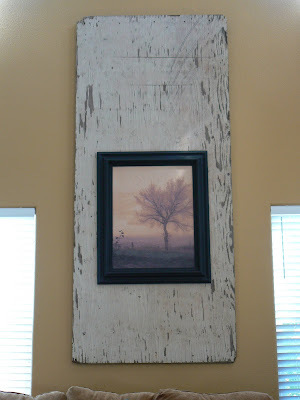 The board is just a backdrop to my favorite tree art print and to give it a taller presence on my super tall walls. Tall walls need tall art. There it is. Final picture. What a cozy feeling it brings to the room. Once again, it's that black + white + new paint color that makes me soooo happy! One more project done. So many more to go! I love it! 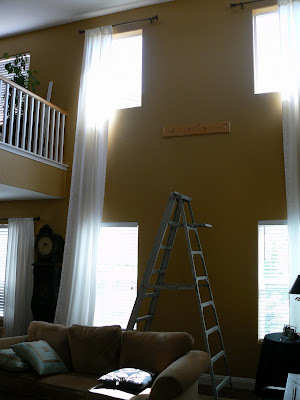 Whats kinda funny is that your walls and window placments, make it kinda look like a big cross! LOL... but seriously, its so beautiful. you have an eye for this! Very cool look. Nice conversation piece too! You tell your husband that I would pay MONEY for that piece of wood! YUM. Have you thought about putting a hook (an old door handle? round wooden curtain finial?) above the picture -but still on the wood-and "hanging" it with something so there is as much room from the bottom of the print to the edge on the bottom as there is from the hook to the edge on the top.....does that make sense? Whatev. GORGEOUS. AND one of a kind, which, lets face it, is priceless. SO here is my question? Where are you going to put up the top pick family photo? You know the ONE.. Where's that going, huh, huh? 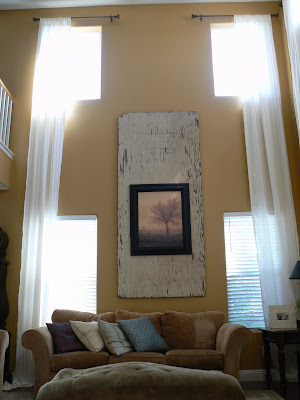 I want to see you post a picture on the blog that you actually put that one up in your house. It's so classic, comeon! Love it! Heather kept telling me about this great piece of wood that you put up for art. We're moving back home this week. Yah!!! Thanks for the inspiration.